The assembly election results show that Modi’s personal popularity is struggling to pull votes, and puts a big question mark around the outcome of 2019 Lok Sabha polls. Narendra Modi, the Indian prime minister, took two big blows in less than 24 hours. Investors should worry less about the bruises, and more about what he might do to recover from them before next year’s general elections. The first knock came on Monday evening when besieged Reserve Bank of India governor Urjit Patel abruptly resigned. Although he cited personal reasons, nobody is in any doubt that it was New Delhi’s incessant harassment that led to the monetary chief’s early exit. Team Modi, it appears, is out to reshape the RBI, ultimately leaving it with an emaciated balance sheet, little power of supervision over banking and finance firms, and under the thumb of a bunch of bureaucrats. Why an 83-year-old institution needed such a remaking now became clear in the second punch. Votes counted on Tuesday handed defeats to the ruling party in three key state elections. The fact that Modi’s personal popularity is struggling to pull votes puts a big question mark around the outcome of next year’s parliamentary polls. How does Modi make it right with voters in six months? How does a government that has little fiscal firepower deal with agrarian distress and dismal growth in urban jobs? By getting a credit boom going, of course. With the blessing of a pliant central bank. That’s where the whack of Patel’s departure is related to the thwack Modi got from voters. What the prime minister might do in response could please speculators, but long-term investors should be nervous. Stimulating the economy is fine, but who’ll lead the charge? Large corporate balance sheets in India are still under repair. And among the 21 state-run banks, which have the lion’s share of cheap deposits, as many as 11 are facing various degrees of lending restraints as a punishment by the RBI for their prior recklessness. What Modi needs now is a central bank that will shield errant corporate debtors from bankruptcy, and unshackle the undercapitalized state-run banks, so they can get together and start a new credit party. Better still, the lenders could be recapitalized by raiding the RBI’s balance sheet to help unleash their animal spirits. That, after all, was also a bone of contention between Patel and New Delhi, which believes the central bank has something like $50 billion of excess capital sitting idle on its balance sheet. Indian markets’ behavior on Tuesday showed how traders are viewing Patel’s exit as a get-out-of-jail-free card. An index of state-run lenders jumped 2.65 percent. Yes Bank Ltd., a private-sector lender which has repeatedly misreported its bad loans to the regulator, and whose co-founder, Rana Kapoor, has been asked by the RBI to leave as CEO by next month, surged more than 7 percent. But it’s the non-bank shadow lenders that will do the heavy lifting. With the liquidity crunch brought on by the bankruptcy of infrastructure lender IL&FS Group easing, bank lending to these finance companies is expanding again, and they’re likely to rev up everything from truck-financing to subprime mortgages. Capital isn’t a problem. After all, it’s not uncommon for the equity in shadow finance companies’ operating companies to be funded via bonds issued by their unlisted holding companies, which are lapped up by Indian mutual funds. The RBI has so far been too caught up with banks to look closely under the hoods of these shadow lenders. Now, with a pro-growth government dictating the regulator’s agenda, limits on leverage could be relaxed even further. Desperate populism doesn’t always need the state’s resources – as long as taxpayers are on the hook to socialize private losses later. Things don’t have to be so bleak, but the twin blows to Modi have surely raised the risk. Your only goal Modi bashing. So you will spread nothing but lies.. Which part is a lie? Life is not so simple. It takes a sapling time to grow into a tree and yield fragrant alphonsos. 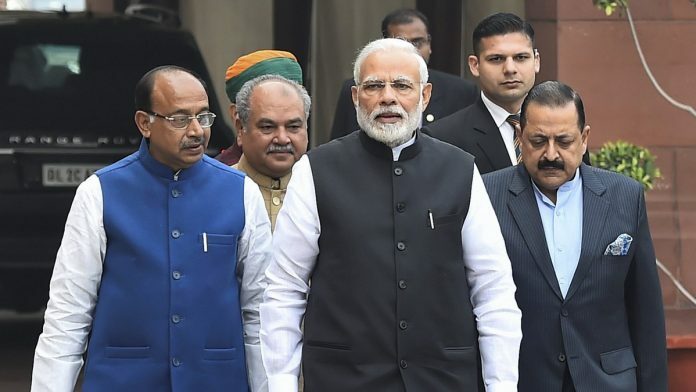 In effect, barely three – not six – months remain for the ECI to notify the schedule for the general election, when the Code of Conduct becomes operational, making the government a caretaker institution. Just how much juice will flow from the RBI’s vaunted, vaulted reserves to wherever it is needed, how many loans will be approved by the essentially bankrupt banks under PCA, what bolt of electricity will flow into the SMEs, how many young people will get hired, how many cars and consumer durables will be bought on EMIs, difficult to judge. Consider the parlours state of the fisc. Getting such a heavy bird airborne with so little ATF in the tanks is not easy.